When you have logged into a specific repository, you will be able to see all folders and files for which you have the appropriate rights. The behavior in the Address bar and the Navigation and Detail panes are very similar to the functions in MS Explorer. Therefore, you can navigate selecting folders in the Address bar, clicking folders in the navigation pane or double-clicking folders in the Details pane. Clicking on the or symbol will expand or collapse folders in the Navigation pane. 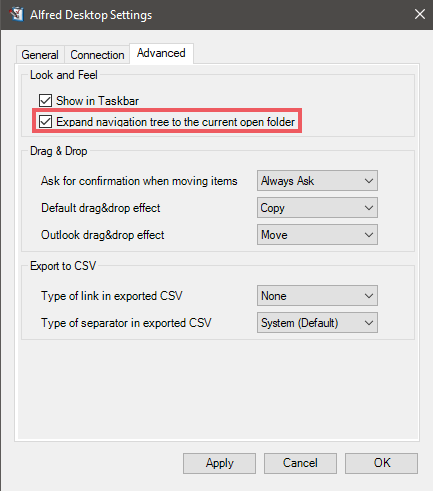 Clicking on a folder in the Navigation pane or double clicking the folder in the Details pane or selecting “Open” will set that folder as your workspace. The path of the selected folder will be displayed in the Address bar. The name of the Browser tab will be updated to the name of the selected folder. 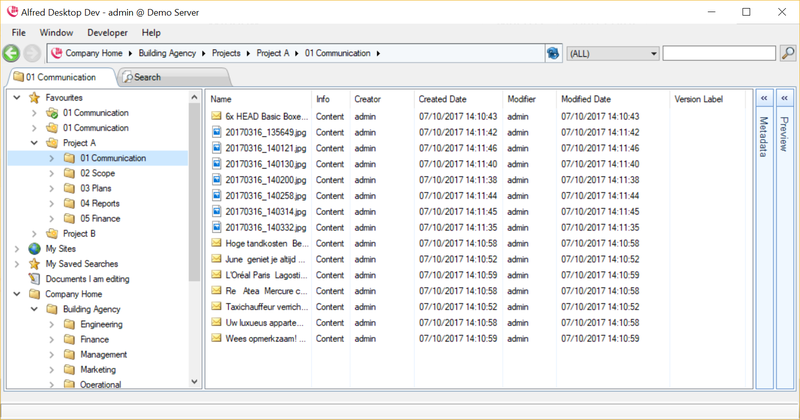 Setting a folder as your workspace allows you to work continuously in the selected folder without having to click through the tree structure. Closing the Alfred Desktop application will not change the workspace folder when you re-open Alfred Desktop. Search actions are restricted to your current active workspace. 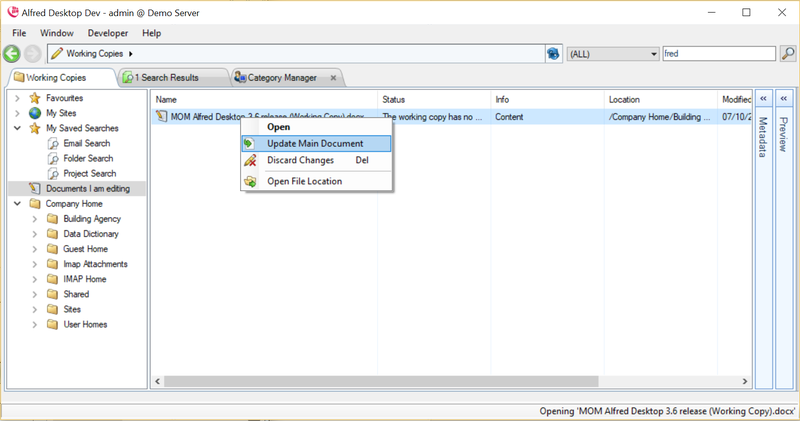 The user can opt-in for the automatic folder expansion feature in the Navigation pane. 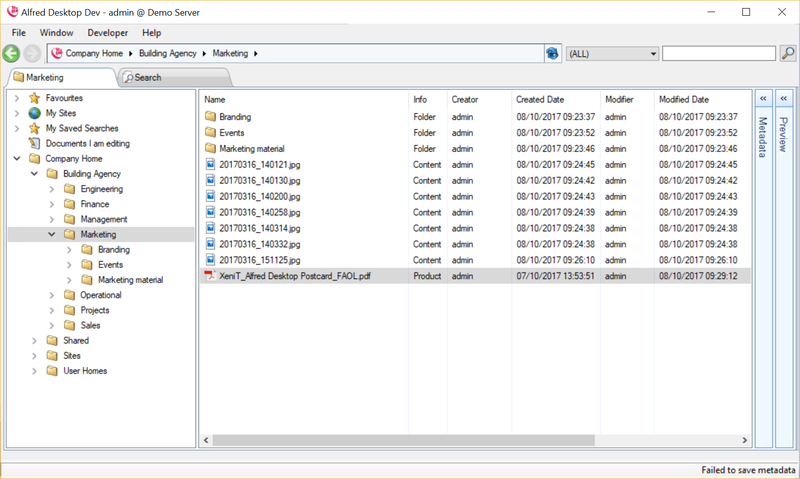 Once this feature is enabled, the Navigation pane will expand the folder path until it is able to display the currently opened folder in the Content pane. This expansion is also executed when the user connects to the repository, which may cause some delays in cases of large folder structures. Clicking on any folder in the Address bar at the top of the page will set the selected folder as the active workspace. You can use the drop-down lists at any location in the path to move to another subfolder in the tree. 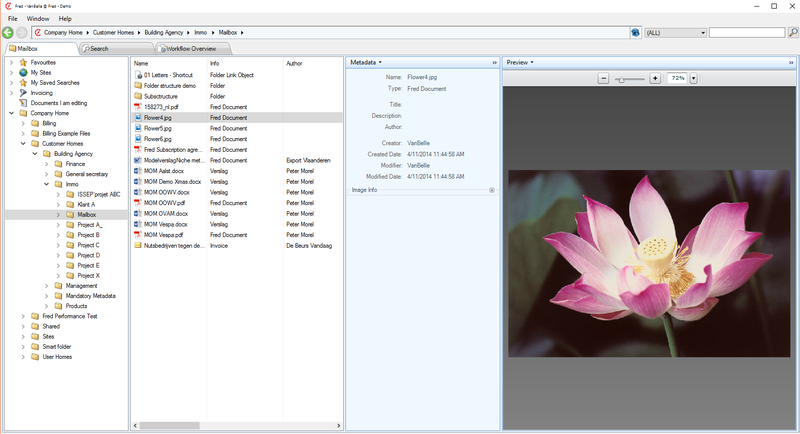 Similar to a Windows interface, you can use the back and forward buttons to browse between previously viewed files and / or folders. 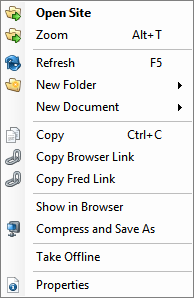 It is possible to add a folder to your Favorites in Alfred Desktop. You can do this by right clicking on the folder that you want to include as a Favorite, and selecting the “Add to Favorites” option. You can also drag and drop a folder into the Favorites list. When adding folders to your Favorites, you will be able to navigate into the subfolders of the Favorite folders. As such, the Favorites becomes a full functional personalized folder structure in which you can manage your documents. You are able to drag and drop documents into your Favorite folder structure. These documents will be uploaded into the appropriate folder. Note that the breadcrumb at the top will change from the Favorites to the full path indication if you move deeper into the folder structure. You can start a search query from the Favorite folders. You can launch this from the quick search in the navigation tab or you can select Favorites in the Location field of the Search tab. See also ‘Searching’, for additional guidance using the Search features. When you are a member of a Share Site, the document library of that Share Site will automatically appear under ‘My Sites’. The document library folder will be presented as a folder with the name of the Share Site. For the document library to appear under ‘My Sites’, you need to be a member of the Share Site. Public or Moderated Share Sites will not appear under ‘My Sites’ if you are not a member. Show in Browser will bring you to the document Library of the Share Site in your default web browser. 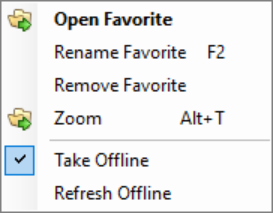 Take Offline will synchronize the content of the folder on your desktop. This folder will also appear in the Favorites folder. For further information, see ‘Taking content offline’. You are able to navigate in the subfolders of the My Sites folders. 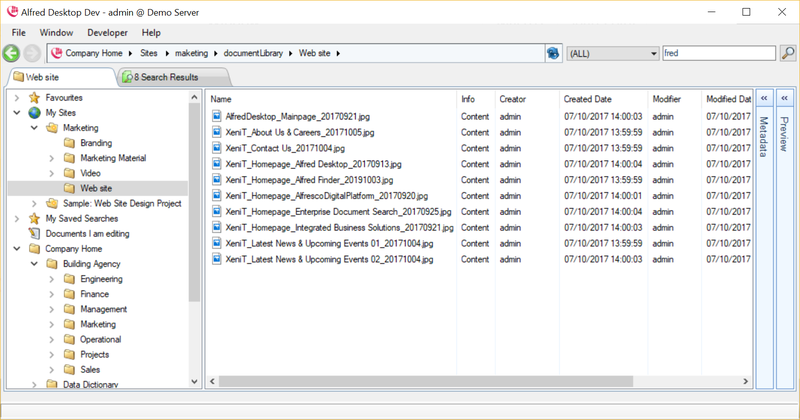 You are able to drag and drop documents into your My Sites folder structure. These documents will be uploaded into the selected folder. Note that the breadcrumb at the top will change from My Sites to the full path indication if you move deeper into the folder structure. You can start a search query from the My Sites folders. You can launch this from the quick search in the navigation tab or you can select My Sites in the Location field of the Search tab. This folder provides you with a list of all search queries you have saved. Clicking on a search will execute that search again, and present the result in the Search tab. You can open multiple browser tabs by clicking the Window / New Browser Tab command or using the shortcut Ctrl + T. Each browser tab provides a view on the repository. 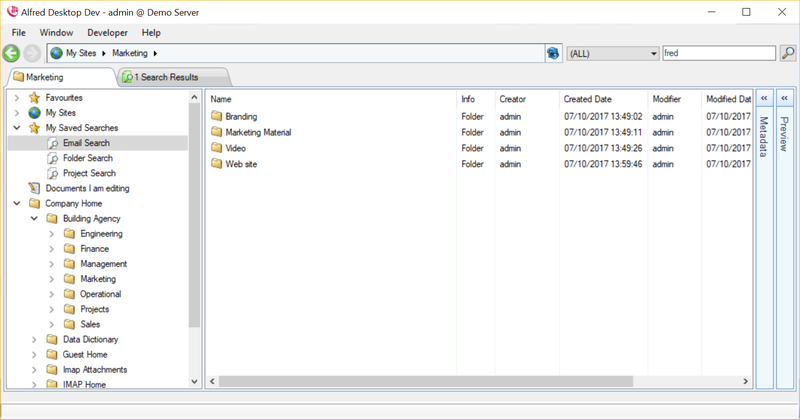 Each tab will display the name of the active folder.